Winter Storm Thor is coming for Maryland and it’s bringing down the hammer of winter on the North East. Central Maryland is on the verge of being blanketed by another 6 to 10 inches of snow, after only just recovering from the previous snow and ice storms. The Atlantic Maintenance Group is bracing in preparation of its arrival and is ready to spring into action at the storm’s arrival. Winter Storm Thor is a multi-day system that has brought a hammer of wintry weather down on most of the country. Winter Storm Thor’s reach has touched from California to Maine, and most of the states in-between. Winter Storm Thor has caused 7 deaths from car accidents due to icy roads, and tonight it’s poised to drop heavy snow on West Virginia, Virginia, Maryland, Pennsylvania, Delaware, and New Jersey. Winter Storm Thor’s path across the country has left wintry destruction behind it. In the West, Winter Storm Thor has caused mudslides, hail, and snow. In the southwest, Arizona has suffered from icy conditions and Colorado has received an new layer of snow. The Midwest and Central United States have received ice and snow that have been the cause of many accidents, some of which resulted in fatalities. And now finally, Thor is coming for the East Coast, with its sights set on the Mid-Atlantic. Weather forecasts predict the heaviest snow in West Virginia and Kentucky. However, Maryland, Northern Virginia, Pennsylvania, and New Jersey will get the next heaviest amount of snow, estimated at 6 to 10 inches of snow. The storm has already begun as rain, which will turn to freezing rain, sleet, and finally snow later tonight. The storm is predicted to continue going strong all of Thursday. The Atlantic Maintenance Group knows that snow, like what Winter Storm Thor is bringing to the Mid-Atlantic Area, can be a problem for your business or life. 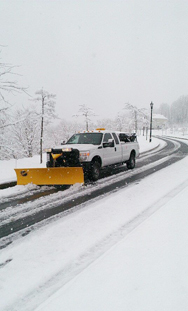 The Atlantic Maintenance Group provides professional snow removal for the commercial and residential clients in Delaware, Maryland, Pennsylvania and Virginia. We plow commercial and residential pocking lots. We clear roads and side walks, and provide salting services. We can even relocate large quantities of snow to other locations on your property if necessary. At Atlantic Maintenance we know just how important it is to keep your Maryland business or home accessible even during the most brutal weather conditions, that’s why we provide expert commercial snow removal services for clients throughout Maryland, Pennsylvania, Virginia and Delaware. Make managing your property stress free and let our team of snow removal experts take care of everything from shoveling to plowing. We’re experienced in removing snow from parking lots, roads, sidewalks, as well as salting and ice melting. We can handle properties of any size, and will respond immediately when a winter or snowstorm strikes. To get your free quote on snow removal services now, give us a call at 410-768-4720 or contact us via our website today. You can also follow us on Facebook, Twitter, Pinterest, and Google+ to see how we’re growing! This entry was posted on Wednesday, March 4th, 2015	at 8:50 pm	and is filed under Snow Removal	. You can follow any responses to this entry through the RSS 2.0	feed. Both comments and pings are currently closed.